I was so excited to read Susan Hill’s second reading diary, Jacob’s Room is Full of Books, particularly as I so enjoyed her first, Howards End is On the Landing. Released in 2017, Hill has set out to chart ‘a year of her life through the books she has read, re-read or returned to the shelf’. I was expecting a similarly warming tone to the first instalment, as well as the excuse to fill up my to-read list with dozens more titles. ‘When we spend so much of our time immersed in books, who’s to say where reading ends and living begins?’ asks the book’s blurb. In Jacob’s Room is Full of Books, Hill shows how ‘the two are impossibly and gloriously wedded.’ Her reading diary promises to be ‘full of wry observations and warm humour, as well as strong opinions freely aired… a rare and wonderful insight into the rich world of reading from one of Britain’s most distinguished authors.’ The structure of Jacob’s Room is Full of Books is made up of small sections, all of which are arranged chronologically and slotted into monthly chapters, aiming to give one an insight into an entire year of reading. Hill opens by discussing audiobooks and ebooks, and what she believes to be the strengths and pitfalls of both. She then touches briefly on what she thinks makes a bestseller, a theme which she comes back to again and again as the book goes on. More themes along these lines, which tend to become a little repetitive, are Hill’s telling us about her own writing career, and giving advice to aspiring writers. My main qualm with Jacob’s Room is Full of Books is that there is a lot of non-reading-related content throughout. As opposed to Howards End is on the Landing, which is wonderfully bookish from beginning to end, there were quite a few points in the book when I wished Hill would stop mentioning her famous friends – often for little reason – and dig a little deeper into literature. She is concerned throughout with those whom she knows from the upper echelons of society, and various members of the royal family make cameos in sections which have nothing to do with reading. She does include quotes from other authors, or from books, but these rarely feel integrated well; rather, it takes one a little while to recalibrate and realise what Hill is doing. She is, as the blurb says, opinionated in this book, far more so than in the first. Regardless, there are some nice, and relatable, paragraphs about book collecting, and various tomes which she has returned to over the years. A section which I particularly enjoyed takes place in February, when Hill feels the compulsion to reorganise her bookshelves. She writes: ‘Not the weather for standing around more than two minutes admiring the spring flowers, the weather for clearing out bookshelves. If we ever leave this house, we will not want to start doing it as the removal men are at the door. I thought I had cleared out all the books I would ever need to lose five years ago, but books breed. They beget second copies because you have mislaid the first and buy another, the day before you find the first.’ Another piece of writing which came across as warm and nostalgic involved Hill’s reminiscences about the joy of Ladybird books, after finding a box of forgotten titles from their catalogue in her attic. Particularly given this, her lack of sentimentality in keeping books surprised me; I imagine it is quite rare with regard to other avid readers and people who call themselves collectors of books to have no connection with very few physical objects they’ve read, and have the ability to get rid of them with no problems. The book, overall, has a disjointed feeling to it, particularly with regard to the first few months of the year. In February, for instance, Hill begins her musings by talking about her greengrocer and how cheap it is to buy vegetables, and then she goes on to ask herself why she didn’t like fairytales as a child. The next sections detail, in order, Hill’s spotting of some herons whilst out on a walk, a wish for snow, and a website featuring many lists of five books, all of which have been recommended by different people. There are no connecting bridges to link the content; rather, it feels more like random day-to-day scribblings which have been taken straight out of a journal without much thought to how they fit together. Stylistically, Jacob’s Room is Full of Books is easy to dip in and out of in this manner, but when reading it all in one go, it does feel a little awkward. I did enjoy Hill’s forays into nature writing, and felt that these worked well. However, I cannot help but think the book may have been stronger had it been marketed in less of a misleading way as A Year of Reading, and more as a year in the life exercise. Perhaps half, or maybe 60%, of the book is actually related to reading. Some months do include more of Hill’s thoughts about reading and writing, but there are far less recommendations here than in the first volume. The tone feels quite different too, and this is nowhere near as much of a cosy read as the first. The balance in Jacob’s Room is Full of Books does not feel quite right, and some of the sections are so brief that they feel awkward to read. I had hoped that it would be a continuation of Howards End is on the Landing, but it does not fill that criteria in its execution. I found this volume disappointing on the whole; not what I thought, or hoped, it would be. However, Jacob’s Room is Full of Books is still a quiet, meditative read, particularly with regard to the nature she captures, and the slower sections about literature. The Guardian promises that Christopher Fowler’s The Book of Forgotten Authors is ‘a bibliophile’s treat’, and Stylist calls it ‘the perfect guide to finding your next reading obsession’. I spotted the paperback edition, which has been expanded and updated, in the library, and could not resist adding it to the small pile of tomes already in my arms. The book appealed to me, as I love anything which brings my attention to authors whom I have not before considered, or have never even heard of. The Book of Forgotten Authors includes ’99 forgotten authors, their forgotten books, and their unforgettable stories.’ It has been split into separate sections, each of which encompasses around ten different authors, with a common theme in mind. These categories include ‘The Forgotten Queens of Suspense’, ‘The Forgotten Booker Authors’, and ‘Forgotten for Writing Too Little – and Too Much’. The connections which Fowler makes between each author are loose and tentative, and these categories often overlapped, most of them focusing almost entirely upon mystery authors. Whilst running my eyes over the contents page, I noticed a lot of authors whose names I did recognise, just a few I had never heard of, and quite a few which I have read. Many of the authors whom Fowler includes in this tome do not deserve, in my opinion, to be called ‘forgotten authors’; he writes about Margery Allingham, Virginia Andrews, Mary Elizabeth Braddon, Edmund Crispin, E.M. Delafield, Barbara Comyns, Barbara Pym, and Georgette Heyer, amongst others. Of course, the very nature of this book makes it highly subjective. In his justification for each inclusion, Fowler writes that he asked many people, in the form of an open question, ‘which once popular authors would [you] recommend for discovery?’ The response which he received, with its ‘deluge of suggestions’, was as follows: ‘It seemed that everyone had a personal favourite. Authors I’d long considered to be household names had been wiped from the collective memory, and were ripe for a renaissance. Some were mainstream novels from the recent past that caused sensations in their time. The task of tracking them down became obsessive.’ The process of selecting authors for inclusion here consisted of two distinct factors – whether the author’s books ‘proved difficult to obtain’, and then asking a focus group of around twenty book-lovers whether they had heard of the author in question. Fowler ended up with a master list of around four hundred authors which could have been included. To lessen the number of entries, he chose to leave out ‘nearly all playwrights, poets, screenwriters and graphic novelists, and dumped personal indulgences.’ This, to me, seems like a limiting approach, and I feel as though far more variety would have been included in the book had the odd playwright or screenwriter been focused upon. I did not enjoy Fowler’s personal prose style, and found the book was something I was having to force myself to read, rather than picking it up out of enjoyment. His narrative did nothing whatsoever to engage me, and I found that a lot of the portraits of the authors were repetitive. I did not add anywhere near as many authors or books to my to-read list as I was expecting, and have only found a handful of ‘forgotten authors’ whom I want to check out. If you are interested in reading this, I would recommend dipping in and out of it over a longer stretch of time, rather than reading it all in one go, as I did. The Book of Forgotten Authors sounded highly promising, but there is so little depth to it. Each entry is only around three pages long, and there are sometimes no suggestions for which book a new reader of a particular author would be best to begin with. There is hardly any detail in the biographies which are presented of each author, and I found that they barely whet my appetite, as Fowler had intended them to. The brevity in Fowler’s approach did not work at all well in my opinion. The Book of Forgotten Authors presented the author with such an opportunity, but it felt both lacking and lacklustre throughout. There are far better books than this one which set out to do similar things. On April the 20th 1999, Dylan Klebold and his friend, Eric Harris, killed thirteen people – twelve students and one teacher – at Columbine High School in Littleton, Colorado, before taking their own lives. A Mother’s Reckoning: Living in the Aftermath of the Columbine Tragedy was written by Dylan’s mother, Sue, in order to try and deal with her son’s actions. Of course, A Mother’s Reckoning is harrowing in its content, from its informative and thoughtful introduction by Andrew Solomon to its closing pages. In her preface to the paperback edition, Klebold tells us: ‘I began writing about the experience of Columbine almost from the moment it happened, because writing about my son’s cruel behavior and his suicide was one of the ways I coped with the tragedy. I never made a conscious decision to write. I kept writing just as I kept breathing.’ At first, Klebold’s writing was merely personal; she was writing for herself, and did not wish to put her family, or other members of the community, through the ‘shattering experience’ of Columbine once more if it were published. After a while, however, her view changed. She writes: ‘In the end, I was able to take that step [of publishing A Mother’s Reckoning] because the messages I hoped to convey were a matter of life and death. I felt a responsibility to educate parents and families about what happened, and why. I believed that hearing what Dylan had gone through might be beneficial to others, especially those who are struggling with lethal thoughts, or who find themselves or their loved ones trapped in a cycle of hopelessness.’ Klebold now uses her platform to try and educate others about violence, suicide, and mental health, at both a local and national level, and works tirelessly for suicide prevention in the United States. A Mother’s Reckoning uses excerpts from Klebold’s diaries, as well as reflective passages. She has interviewed a wealth of experts from many fields, from law enforcement to psychology, and has woven in their thoughts and arguments too. Klebold’s prose is easy to read, but her story is not. This is particularly true when she recounts, in very matter-of-fact and almost emotionless prose, the details of the shooting. Klebold talks of the fierce anti-gun stance which she and her husband had, not allowing their sons to own guns like a lot of their peers. In fact, they were considering moving away from Colorado, as the gun laws had become too relaxed before Columbine occurred. She wonders, although not at length, whether this would have prevented the tragedy from occurring, but later notes that Eric Harris had approached two friends to commit the atrocity with him before planning with Dylan. A Mother’s Reckoning must have been incredibly difficult to write, but in its approach and musings, Klebold has set the right tone. Of course, her memoir is biased in that she loved Dylan, but the memories of the son which she had often feel in conflict with what was reported about him. The final section of the book discusses at lengths the issues with media reportage of such tragedies; Klebold believes that giving out the details of the shooter, or shooters, inspires copycat behaviour, sensationalising as it does what went on. She also discusses, in this section, markers for depression and suicidal thoughts in children and young adults, and the signs which both she and her husband had just put down to the difficulties of hormonal and bodily changes. Klebold says: ‘This Pandora’s box will never empty; I will spend the rest of my life reconciling the reality of the child I knew with what he did.’ The Columbine tragedy has affected everything in her life, and changed the way in which she views the world around her. She talks openly about the suicidal thoughts which she and her husband had, and the sheer panic which she would feel every time her older son, Byron, was out of her sight. A Mother’s Reckoning is touching and moving; it is as chilling as it is insightful, and aims to help those who may be at risk of carrying out similar attacks. Klebold has discussed not only her own feelings, but has talked about the aftermath’s effects in the wider community, in a compassionate way. A Mother’s Reckoning is an important memoir, in which Klebold exhibits such bravery, and lays her own self open. I purchased a revised and expanded edition of Melissa Muller’s Anne Frank: The Biography on an affecting trip to the Anne Frank Huis in Amsterdam last year. I have been so looking forward to reading it, but for some reason – emotional turmoil over Anne’s story, I expect, which never fails to bring me to tears – it took me some time to pick it up. The Sunday Telegraph deems Muller’s biography ‘sensitive, serious and scrupulous’, and the Independent believes it to be an ‘accurate and honest portrait’. The New York Times writes that Anne Frank: The Biography ‘acts as a supplement to the diary, filling in Anne’s fragmentary view of her own life’. Anne Frank: The Biography opens with a copy of the Frank and Hollander family trees, which become useful to refer to when grandparents and great-grandparents are introduced into the narrative. The initial chapter of the book opens on a scene in August 1944. This, at first, seems like an ordinary day in the annexe in which Anne and her family, along with others, are hiding, but it proves to be the day on which they are discovered by the Dutch Nazis. After they have been taken away, Muller describes how Miep and Bep, office workers who helped them to hide, retrieve Anne’s diary, not reading a single page so as to protect her privacy. They hoped to be able to give it back to her after the war. Counter to its title, Anne Frank: The Biography is not simply a biographical account of Anne; it includes details of both her immediate and extended family members on both sides, as well as accounts of family friends, and her schoolmates. Photographs have been dotted throughout, which adds to the narrative, and shows those around Anne, first in Germany, and then in Amsterdam, where her family moved when she was small. 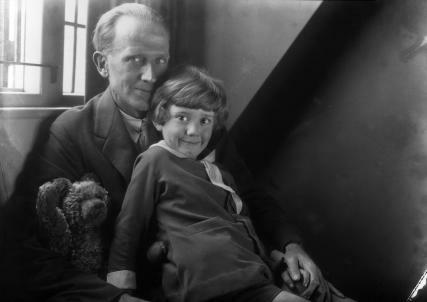 Perhaps most moving in terms of these portraits is the impression we receive of her doting father, Otto. When writing about Anne and Margot’s friends in Amsterdam, Muller says: ‘The greatest delight of all was Mr. Frank. His wife was always there and always friendly, but the children hardly noticed her; they took such things for granted in mothers. But Otto Frank, at almost six feet a tall man for those days, was special. With Mr. Frank you could talk and joke about anything. He made up games, told stories, always had a comforting word, and seemed to forgive Anne everything… Otto’s high spirits were truly infectious. And when he was at home he spent more time with his children than most other fathers did.’ Of course, Anne is always the central focus here, but more of an understanding of her character can be gained from seeing those around her. Muller’s prose style makes Anne Frank: The Biography a very easy book to read; it is intelligent and measured, not to mention packed with detail, but it still feels readily accessible. The biography is considerate and meticulously researched and, as one would expect, is both touching and harrowing throughout. Anne Frank: The Biography is a moving and detailed tribute to a remarkable young woman, and works as the perfect companion to The Diary of a Young Girl.